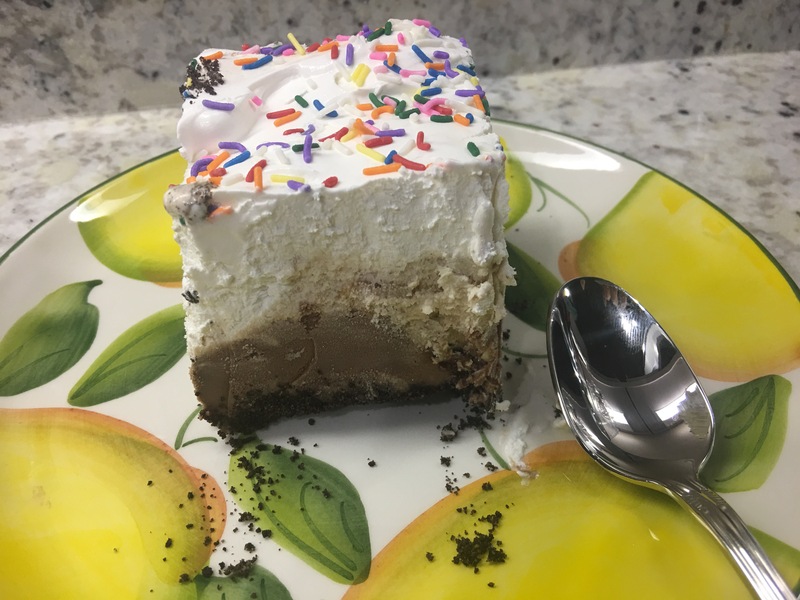 Who doesn’t love a good ice cream cake? Here’s my favorite recipe. Best of all it’s CRAZY easy! Enjoy! In a food processor or blender, pulse the whole Oreos into a fine crumb. Stir the cookie crumbs and melted butter together, then press into a 9×13 pan. (No need to grease the pan prior.) Make sure it is very tightly packed– I use the back of a spatula to firmly press it in. During that time, place the softened chocolate ice cream in a bowl and give it a good stir to rid any frozen lumps. You want a nice smooth, soft ice cream. Spread it on top of the frozen crust. During that time, place the 2nd ice cream flavor into a bowl and stir it until it is smooth and very soft. Carefully spread on top of the chocolate ice cream. Make sure the hot fudge is spreadable consistency. You may have to slightly heat it if using store-bought. Spread it on top of the ice cream. Spread whipped topping on top of hot fudge layer, then top with sprinkles. Cover with aluminum foil and freeze for at least 12 hours before serving (and up to a few days!). Use a very sharp knife to cut, making sure you are cutting into the crust.